Community nurses from the Trust celebrated International Nurses’ Day – by jumping on a bus. The Primary Care, Community and Therapies group, organised a tour bus to visit six satellite sites in order to reach up to 100 nurses who were unable to attend a wider event held at City Hospital on Friday (May 12). International Nurses’ Day is celebrated on the anniversary of Florence Nightingale’s birth. Health care providers are encouraged to hold parties and events to honour the work nurses do as part of the day. 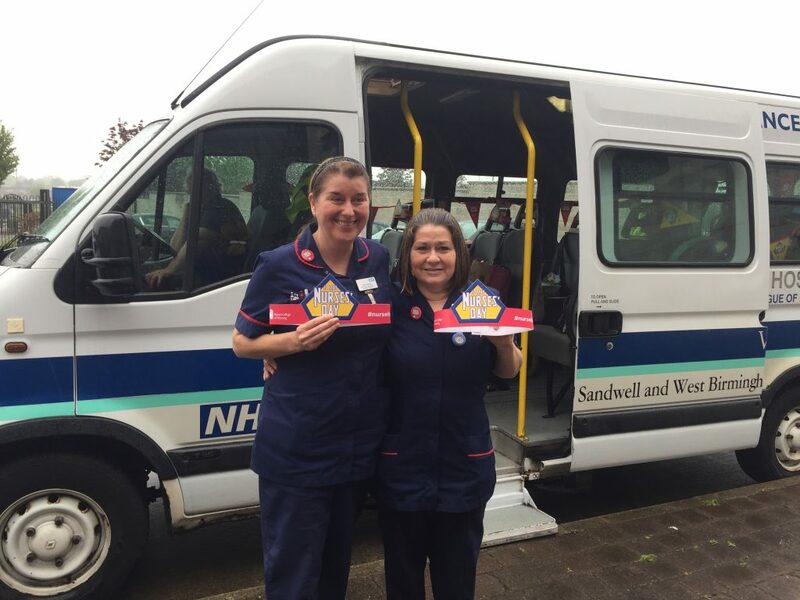 However, Louise Johnson and Denise Owen, who are both matrons for community nursing services, welcomed staff onto a decorated van and handed out goodie bags, as well as healthy treats and a chance to enter a raffle. Louise said: “We wanted to make sure all our nurses got to celebrate this special day and so we decided to organise a tour bus to make this happen. The first stop for the community bus was The Lyng, followed by Oldbury Health Centre, Victoria Health Centre in Smethwick, Rowley Regis Hospital, Neptune Health Park, in Tipton, and finally Friar Park in Wednesbury. Pictured above: On the Community bus, welcoming their first lot of nurses at The Lyng on International Nurses Day are (centre) Louise Johnson and Denise Owen, matrons for Community Nursing Services.